There is joy and wonder in this marvelous mounting of a human mind, and a thrilling audacity in how it dares at such a strange and impossible thing. 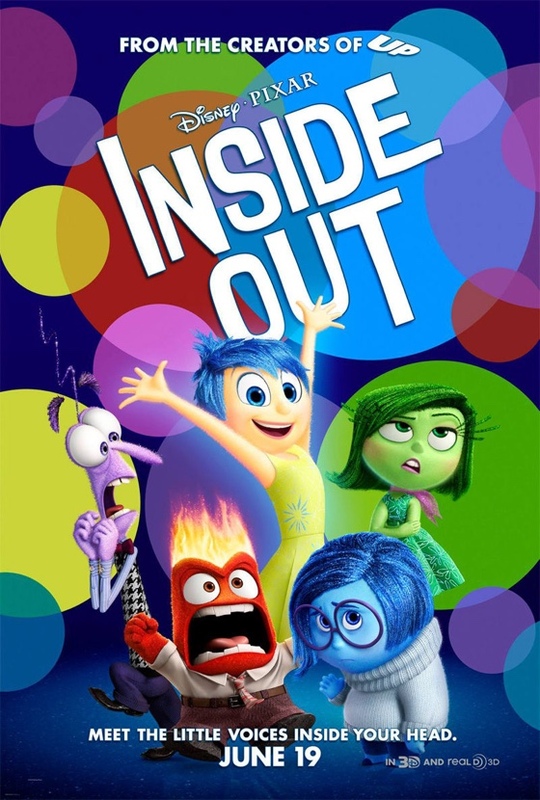 Inside Out is an amazing movie in every way that it can be amazing. 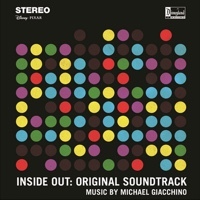 The animation represents another leap forward for Pixar, and for computer graphics, and for what we should expect a movie to do when it is not restrained by a necessity to approximate the real world. It is explicitly not the real physical world where we spend most of our time here, but inside the head of 11-year-old Riley (the voice of Kaitlyn Dias), in the Headquarters where her emotions drive her every waking and sleeping moment. Directors Pete Docter (Up, Monsters, Inc.) and Ronaldo Del Carmen (making his feature debut), both of whom also helped write the script, and their creative team have whipped up wildly inventive and hugely amusing ways to depict the human psyche in all its convoluted, confusing glory, from the imagination to the subconscious to memory to — oh my — abstract thought. There is joy and wonder in this marvelously expansive mounting of a human mind. There would be a thrilling audacity in this if the film merely dared to attempt such a strange and impossible thing, and failed. That it succeeds this well? It’s kinda mind-blowing. There is also Joy (the voice of Amy Poehler: They Came Together, Anchorman 2: The Legend Continues) here, who’s in charge of Riley’s head, what with Riley being such a happy, outgoing kid. (There’s no point in asking whether Riley is happy because Joy is in charge, or if Joy is in charge because Riley is happy. They are the same thing.) Except now Riley and her parents (the voices of Diane Lane [Every Secret Thing, Man of Steel] and Kyle MacLachlan [Breathe In, The Sisterhood of the Traveling Pants 2]) have moved from Minnesota to San Francisco, and it’s awful for her to be away from all her friends and from the hockey team she loves to play on, and awful having to start in a new school, and awful that her dad is so busy with the new job that brought them halfway across the country in the first place. And so Sadness (the voice of Phyllis Smith: Alvin and the Chipmunks: Chipwrecked, Bad Teacher) is trying to edge her way into Joy’s position as boss, because obviously this is all so sad, and she’s infecting Riley’s once purely happy memories of Minnesota and hockey and friendship with her insistence on helping Joy clean up the mess that Riley’s head is right now: all she has to do it touch a little globe of memory for it to become tinged with the sad. 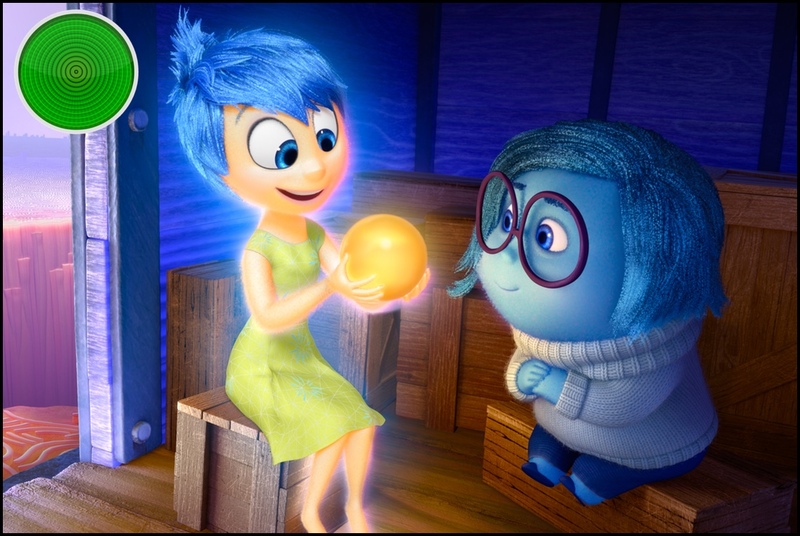 This is where Inside Out gets truly poignant and wonderful and perfect. There’s a thing that happens to little girls around Riley’s age, and it’s not something I can recall ever seeing onscreen. (Maybe there are a few examples, but there are certainly countless comparable depictions of the woes of little boys.) Where boys seem to become more themselves as they transition into teendom, girls tend to lose their child selves, to lose confidence and get narrower and smaller and more contained. (Not all girls, but too many, and it’s terrible to see.) It seems to have a lot to do with suddenly becoming self-conscious about how boys see them, and whether boys will find them attractive… and though that’s not the cause of Riley’s deflating here, what we see as Riley tries to cope with her new life is very similar. And Inside Out gets it. Completely. In a way that no other film that I’ve seen ever has. In a way that I imagine boys and men get to experience all the time, I finally feel like a movie gets me and understands what my life has been. Maybe that’s a bit of a delusion simply because Riley is a girl — this would have been much the same story if Riley had been a boy — but still: that’s a huge thing. It’s like this: While Joy and Sadness find themselves a long way from Headquarters facing a long and difficult journey back, their coworkers Fear (the voice of Bill Hader: The Skeleton Twins, Monsters University), Anger (the voice of Lewis Black [Man of the Year, Accepted], perhaps the most perfectly cast of the entire perfectly cast cast), and Disgust (the voice of Mindy Kaling: This Is the End, Wreck-It Ralph) are left to keep Riley running. And we see, in Riley’s outside world, how this causes her to collapse in on herself, and how her lack of emotional balance means she makes a lot of bad decisions. We see the goofy child that was Riley die — the visual metaphor for this is powerful and heartbreaking — and though of course there’s a happy ending, because this is a Pixar movie, the goofy child does not return. That’s not a spoiler. The goofy child can’t return. That’s okay. That’s the entire point of Inside Out’s exploration of this moment in time as a transition from childhood in which our emotional landscape gets more complex, and we learn how to integrate joy and sadness and see them as complementary. One cannot exist without the other, and they boost each other, and sometimes even occur in tandem. “It’s okay to be sad.” That’s not something that only children need to hear. This is the extraordinary message of a mainstream cartoon in a culture that constantly bombards us with the command to be happy at all times. See also my #WhereAreTheWomen rating of Inside Out for its representation of girls and women.